The Part Time Gourmet: Restrictions on Fluff? 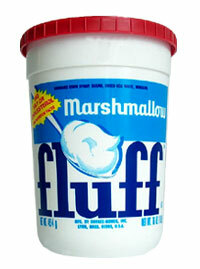 In another example of the East Coast - West Coast food gap, I was shocked to find that many on the left coast are unfamiliar with Fluff. Growing up, a fluffernutter sandwhich (Peanut Butter & Fluff) was a special treat - usually to be enjoyed only at my grandmother's house, as my mom didn't want me having sugar. To this day, I still enjoy one occasionally, and when my wife and I were combining our households prior to our wedding, she wondered what the container to the left was, and why I had it. I couldn't, and still haven't convinced her to try a fluffernutter, but I'm confident she'll give in someday. Another legislator promptly introduced a bill proposing to make the fluffernutter the official state sandwich.